Schaghticoke member William H. Cogswell from Cornwall enlisted in the U.S. Army 5th Connecticut Volunteer Infantry at the onset of the Civil War at the age of 22. During his extraordinary military career he commanded and lead white soldiers, reaching the rank of second lieutenant. The 5th Connecticut skirmished with Confederate forces throughout 1861 and 1862. Cogswell was captured behind enemy lines at Harrisbury, Virginia, but was eventually released. Although official records state he was discharged May 21, 1862, Cogswell was present with the 5th Connecticut in Virginia at the battles of Winchester on May 25 and Cedar Mountain on August 9. Cogswell immediately reenlisted in the 19th Connecticut Volunteer Infantry, known as the Litchfield County Regiment, and was promoted to first sergeant, a rank that gave him authority over four other sergeants, eight corporals, and nearly seventy enlisted men. He served in what became known as the Wilderness Campaign and by March 1864 was promoted to second lieutenant. Cogswell was with his company as the regiment participated in operations throughout the Shenandoah Valley and fought at the Battle of Cedar Creek, Virginia. Next is a photograph of Frank Cogswell, chief of the Schaghticoke tribe from the 1930s until his death in 1954, wearing his regalia during one of the tribe’s powwows. His headdress was given to him by western Indian members of a pan-Indian organization. The blanket, featuring Woodland white- tailed deer, was likely made by his older brother William Cogswell, a former chief of the tribe and a basketmaker and weaver. His features locally obtained turkey tail feathers (Lucianne Lavin, Connecticut’s Indigenous Peoples-What Archaeology, History, and Oral Traditions Teach Us About Their Communities and Cultures, Yale University Press: 2013, pg. 353). 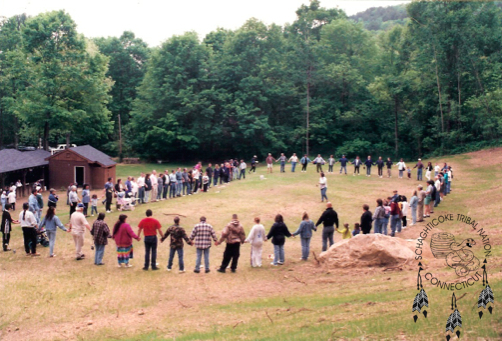 Schaghticoke Powwow (click for larger image). < Traditional powwows, such as this one held about 1939 or 1940 on the Schaghticoke Reservation, were often co-sponsored by pan-Indian movements after passage of the Indian Reorganization Act of 1934. Governor Raymond Baldwin of Connecticut spoke at the 1939 powwow, which was held in honor of American Indian Day in Connecticut. The event was sponsored by the Eastern Algonquian Indian Federation. Indigenous leaders, dancers, and craftspeople from all over the United States attended, including those from the Plains tribes, who camped in their teepees (as they do at powwows today). Their teepees and Plains-style-headdresses are not traditional to southern New England, although Western Indians sometimes gave portions of their regalia to Native New Englanders (Lucianne Lavin, Connecticut’s Indigenous Peoples-What Archaeology, History, and Oral Traditions Teach Us About Their Communities and Cultures, Yale University Press: 2013, pg. 354). < Schaghticoke basketmakers Rachel Mauwee and her sister Abigail Mauwee holding woodsplint baskets on the Schaghticoke reservation about 1890-1894. With them are Abigail's son James Harris - a basketmaker, rattlesnake handler, minister, and the postman for Gaylordsville - and tribal leader Value Kilson, listed in the U.S. census as a collier (Lucianne Lavin, Connecticut’s Indigenous Peoples-What Archaeology, History, and Oral Traditions Teach Us About Their Communities and Cultures, Yale University Press: 2013, pg. 346). < Several members of the Schaghticoke tribe in front of the Value Kilson house along Schaghticoke Road on their reservation early in the 20th century. Tribal leader Value Kilson is standing in the center background next to his grandson Earl Kilson. In the left foreground is Bertha Kilson Riley (holding a child) and Mary Kilson. (Lucianne Lavin, Connecticut’s Indigenous Peoples-What Archaeology, History, and Oral Traditions Teach Us About Their Communities and Cultures, Yale University Press: 2013, pg. 356). Click to view more pictures from Schaghticoke history below. Schaghticoke elder and culture keeper Eunice Mauwee (1756-1860) (Connecticut History, Vol. 43, No. 2, Fall 2004, pg. 136. The Association for the Study of Connecticut History. Ed. Matthew Warshauer, Central Connecticut State University). 19th century Schaghticoke tribal leader Truman Bradley (Connecticut History, Vol. 43, No. 2, Fall 2004, pg. 153. The Association for the Study of Connecticut History. Ed. Matthew Warshauer, Central Connecticut State University). Several members of the Rattlesnake Club in front of one of the houses on the Reservation, ca. 1910. Third and fourth from right are Schaghticoke leaders George Cogswell and Value Kilson, holding snake tongs; second from right may be one of George’s sons William or Frank (Connecticut History, Vol. 43, No. 2, Fall 2004, pg. 150. The Association for the Study of Connecticut History. Ed. Matthew Warshauer, Central Connecticut State University). Frank Cogswell in front of his home ca. 1950 (Connecticut History, Vol. 43, No. 2, Fall 2004, pg. 154. The Association for the Study of Connecticut History. Ed. Matthew Warshauer, Central Connecticut State University). Value Kilson attempting to remove graves from the second Schaghticoke burying ground before it was flooded by construction of the dam at Bull’s Bridge (Lucianne Lavin, Connecticut’s Indigenous Peoples-What Archaeology, History, and Oral Traditions Teach Us About Their Communities and Cultures, Yale University Press: 2013, pg. 356). The later razing of the Kilson reservation home (Lucianne Lavin, Connecticut’s Indigenous Peoples-What Archaeology, History, and Oral Traditions Teach Us About Their Communities and Cultures, Yale University Press: 2013, pg. 356). This reproduction of a postcard from 1908 shows Edson Charles Harris, eldest son of Schaghticoke leader James Harris, handling a live rattlesnake (Lucianne Lavin, Connecticut’s Indigenous Peoples-What Archaeology, History, and Oral Traditions Teach Us About Their Communities and Cultures, Yale University Press: 2013, pg. 345). Henry Harris, a well-known basketmaker, gunsmith, and tinsmith. 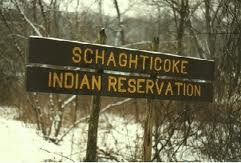 Harris married Schaghticoke Abigail Mauwee and resided on the Schaghticoke reservation in Kent, Connecticut (Lucianne Lavin, Connecticut’s Indigenous Peoples-What Archaeology, History, and Oral Traditions Teach Us About Their Communities and Cultures, Yale University Press: 2013, pg. 343). Nick Bellantoni, retired Connecticut State Archeologist, assisted STN in this meaningful native burial.